Automotive Services offered by DT Service Centre in Al-Quoz! We offer a wide range of automotive services. Look, we know you’re busy and we also know that a trip to Al-Quoz isn’t exactly something you find on someone’s bucket list. Fret not, we will pick up the car for you, and drop it off washed inside and out, for free! Of course, you must approve a repair for this offer to apply, otherwise checking charges and pickup/delivery charges will be levied. 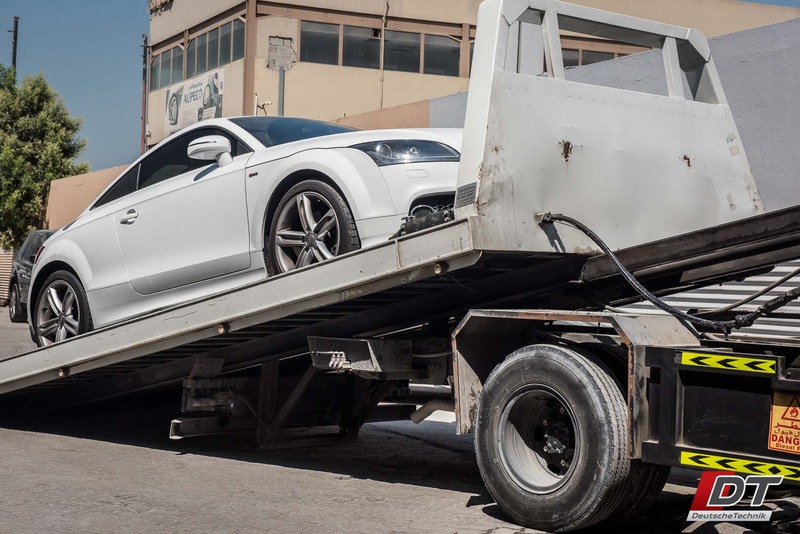 Buying a car in the UAE can be a treacherous and financially devastating ordeal. The RTA inspections aren’t worth the weight of the paper they are printed on, and if you aren’t careful, your purchase can cause you a lot of big problems. We have seen it countless times, and it is especially difficult to absorb the cost of buying a troubled car when you realize all of this pain and heartache could have been avoided had you simply visited Deutsche Technik for a pre-purchase inspection or PPI. Avoiding catastrophe isn’t the only benefit, getting a PPI can also save you a lot of money when purchasing the car. At DT, we provide a professional computer generated report and repair estimate with every PPI. This in and of itself is the most powerful negotiating tool you could ask for. DT offers four A/C related services separate from A/C repair services. We can re-gas your A/C system, replace the cabin air filter, deodorize the system, and our personal favourite, clean out the A/C evaporator. A/C ReGas: Make sure your A/C system has the proper amount of A/C gas so you don’t damage expensive A/C components and you get the best possible cooling. We use high quality refrigerant with the correct amount of lubricant inside to make sure your A/C system runs better for longer. A/C Cabin Filter Replacement: Often a neglected part, this role of the filter is to remove particulate matter from the air before it reaches the cabin. Over time, it becomes black with soot, dirt, and grime. This should be replaed at least once per year, especially in the high-humidity environment we live in. It can also cause bad smells from the A/C system. A/C Deodorizer: This chemical spray-like mist circulates through your entire system as well as the cabin and serves to remove and even disinfect the system. Highly advisable to carry out this service twice per year. A/C Evaporator Cleaning: The A/C evaporator is is essentially a metal grill that the air flows through before reaching the vents. The evaporator cleaning procedure removes a great amount of disgusting build up on the evaporator. You will be horrified to find out that the air hitting your face first had to come into contact with this vile stuff. Tired of scratching and gouging your beautiful alloys? Want to add some style with a colored wheel-rim protector? Wheel protectors offer both protection and style. 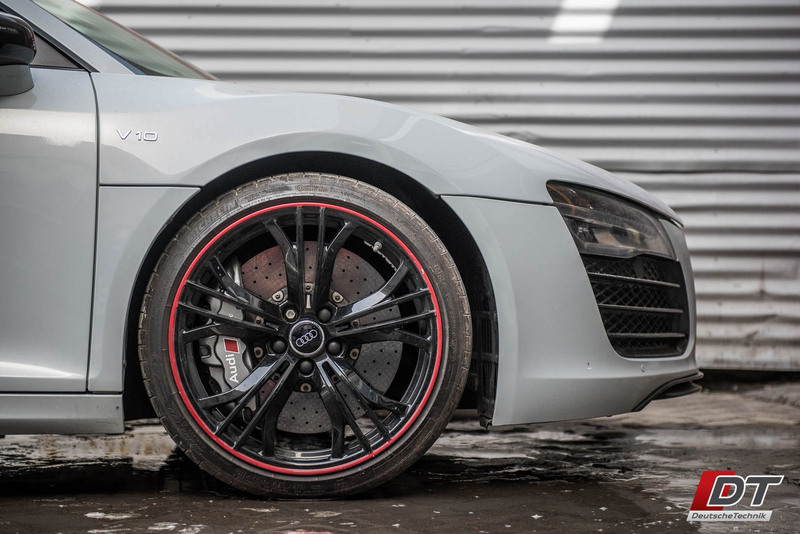 Deutsche Technik offers both value and quality oriented brands of wheel rim protectors so you can get exactly what you want. Curb rash is a very real thing. In fact, many of the rims you see here in the UAE have brushed up against a curb and as a result look terrible and this serves to devalue the whole aesthetic of the car. 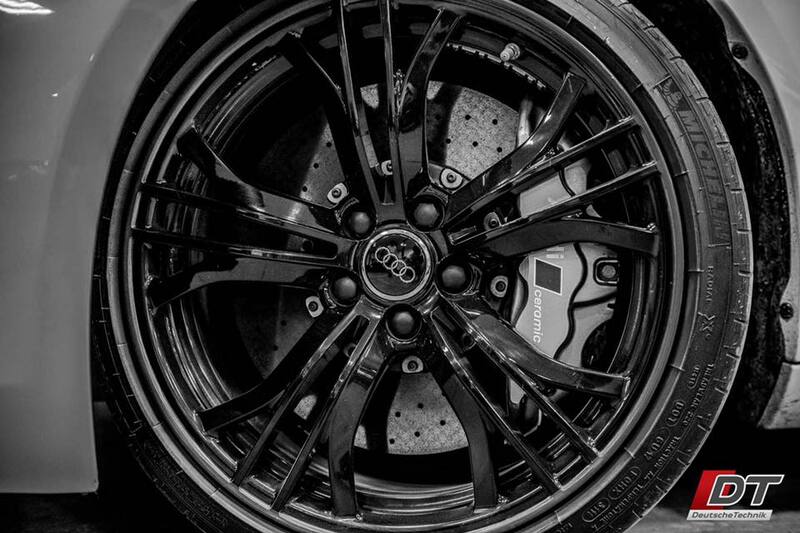 Deutsche Technik can repair any wheel and have it painted or even diamond cut to make it look as good as it did brand new. Custom colors are also available so you can get the exact look you desire. .
On modern direct injection engines, carbon build up is a very real thing. If it is not kept at bay during maintenance services, it can cause misfires and some very expensive repairs down the line. Excessive carbon builds up on the top of intake valves of all direct-injection engines as the fuel, which is a solvent, doesn’t flow past the top of the intake valves like in port injection engines. In older port-injection engines, the fuel flowed through the intake manifold and over the valves, which served to also keep carbon build up inside the manifold and on top the valves at bay. Carbon also builds up on the high-pressure injectors in direct injection engines. To keep this carbon build up from creating problems in the future, Deutsche Technik recommends that you carry out two additional services during each scheduled maintenance service. The first, is simply pouring in an injector cleaning additive into the fuel tank, but not just any injector cleaner. Deutsche Technik use a German brand product that has proven its effectiveness from first-hand experiences at the shop. The other is a more complicated and time consuming process that involves slowly pouring another type of chemical into the intake manifold while the car is running so it removes the carbon buildup in the manifold and on top of the intake valves. Both of these procedures can be considered maintenance procedures. in our experience, if the carbon build up is already causing a problem, only a physical cleaning will fix it, as the two aforementioned procedures can only do so much. 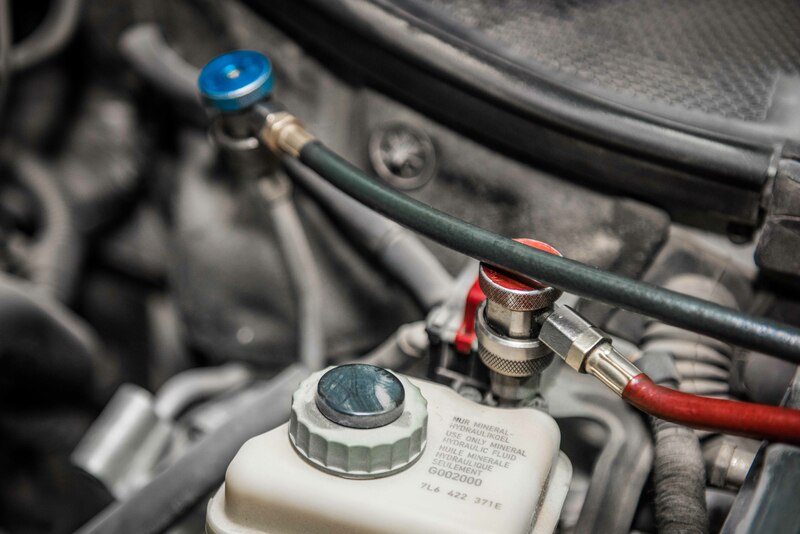 Brake fluid, by design, is hygroscopic, which means it absorbs moisture that gets into the system. It does this so that it can disseminate the moisture throughout the fluid to prevent localized build up of moisture which will boil under heat causing a loss in braking power, and also cause corrosion. At DT, we test brake fluid for moisture content and corrosive contaminants and give a recommendation to flush the brake fluid based on this chemical test. The brake fluid bleeding service is therefore paramount to the longevity of your braking system components and your safety. 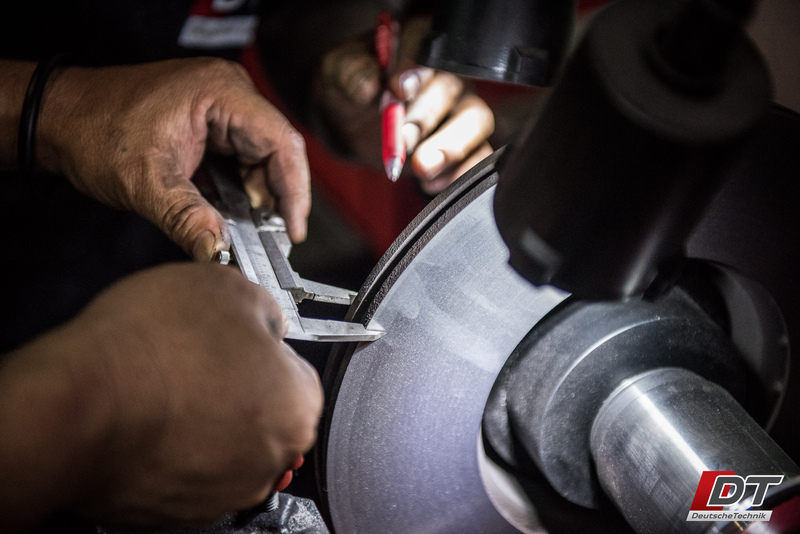 We also offer another service if your brakes are making noise or you are experiencing a judder under braking. We skim the brake discs, sand down the pads, clean the calipers and thoroughly lubricate the metal-on-metal contact areas with copper grease as well as use specialised silicon grease on the slider pins. This service increases the remaining life of your braking components as well improve brake performance significantly. 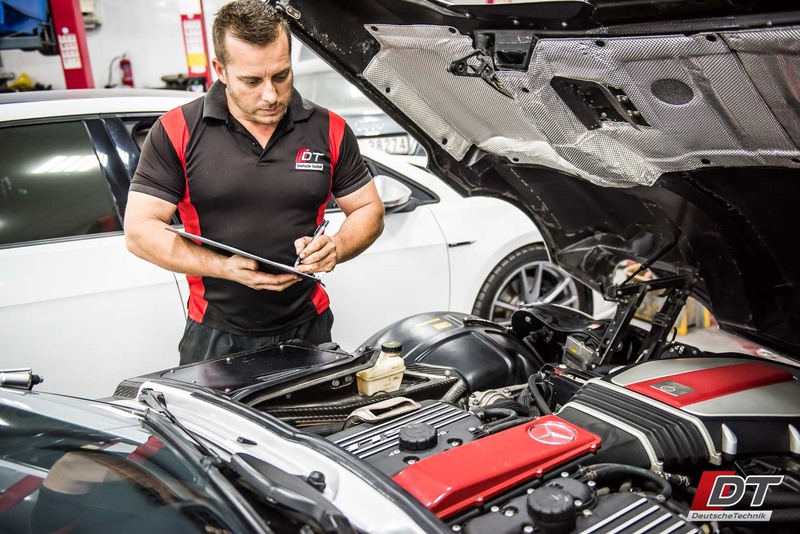 If your coolant looks dirty, or you have been to an untrusted workshop and you’re not entirely sure what kind of coolant resides in your car’s cooling system, then you should absolutely get a coolant flush. 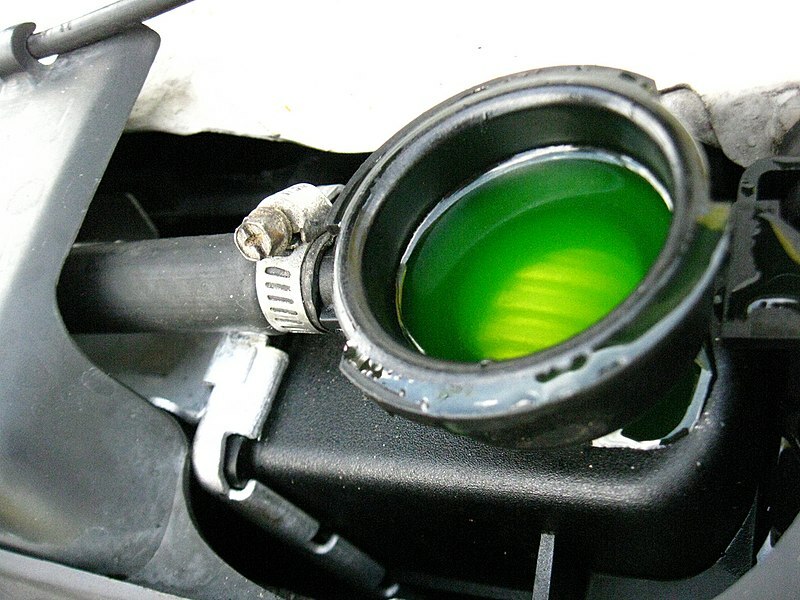 Coolant is a mixture of what is commonly referred to as “antifreeze” and distilled or demineralized water. 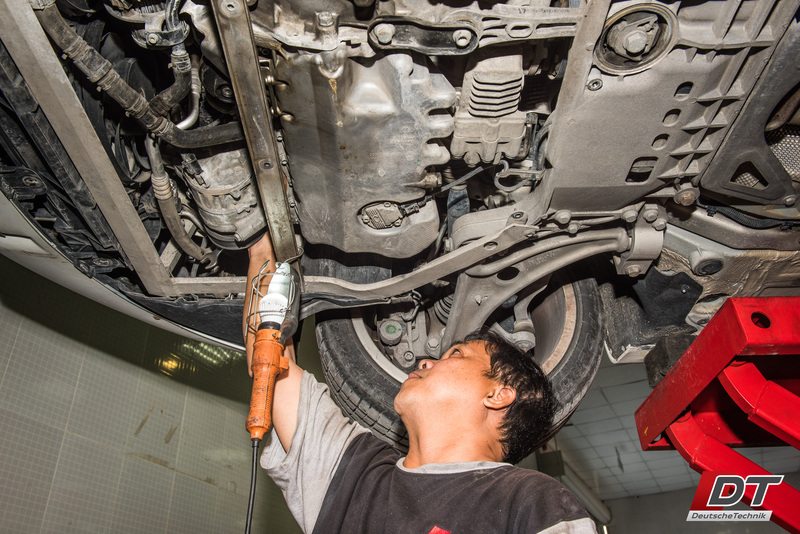 Many workshops in the UAE use normal water which slowly erodes the rubber hoses, and promotes coolant leaks. It also promotes corrosion in the coolant passages which can cause a huge amount of damage over time. At Deutsche Technik, we use quality coolant from Liqui-Moly in Germany and mix it with pure distilled water to make sure you nothing short of the very best coolant in your car. Overtime, oil coaggulates and forms nearly solid deposits throughout the car. Deutsche Technik offer a service to battle this build up and remove it completely from your car so your engine is perfectly lubricated. This build up can cause the engine to be noisy, and in some cases, starve certain components from lubrication, causing their failure which often triggers a chain reaction in the engine and several other components can fail as a result. 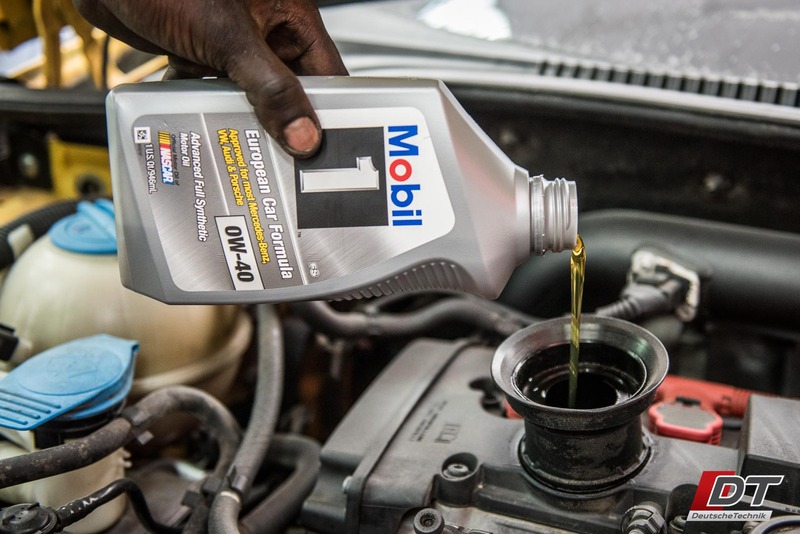 Next time you are in for service, ask about our engine oil flush service. It’s best done during scheduled maintenance. Let’s face the facts, you’re a busy person, and going to the RTA to get your car passed and registered isn’t how you want to spend your evening. You’re lucky you’ve landed on this web page. Deutsche Technik offer a concierge service for this very thing. We pick up the car from your home, inspect it at the workshop to make sure it will pass the RTA inspection, then take the car to the RTA for passing and registration, back to the workshop for an inside and outside wash before dropping it back off to your home. What more could you ask for? Book your car in today. Why spend the mountain of money that’s needed to sell your car so you can buy the facelifted model that has nothing more to offer than a different exterior aesthetic and some wheels? And why is it that only the ultra-expensive “sports” versions of cars get the cool wheels and body kit? 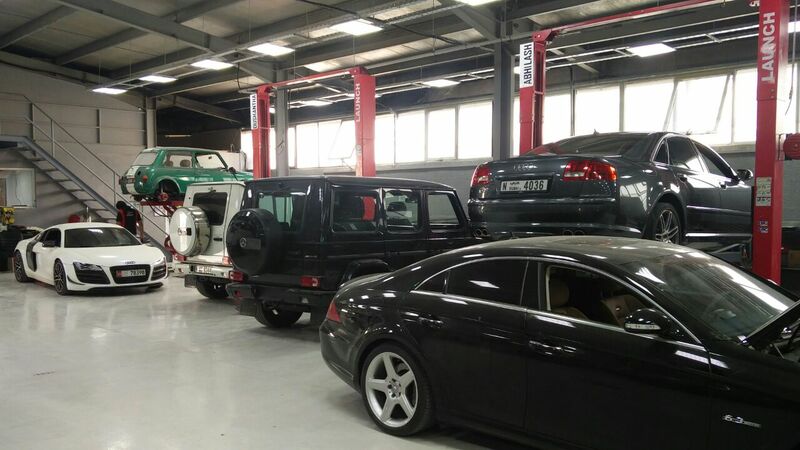 Deutsche Technik can make your Mercedes G500 look like the latest model Mercedes G63 AMG, and we can do the same for several Range Rover models as well. In fact, many cars qualify for this treatment. For example, the Audi Q7, Mercedes S-Class, BMW 7-Series, Bentley Continental, and many more! Looking for a fresh new look without breaking the bank? Give us a call! Terraclean system removes carbon buildup from your engine and fuel system. If you've been experiencing a rough idle, misfires and poor fuel consumption, that could be due to carbon buildup and Terraclean is here to clean with just that. Give us a call to get your car running smooth again!